The ordinary morning and the extraordinary girl. After I change her diaper, I set her on the floor and walk down the hallway. Come along, Charlotte, my love, my beautiful girl. Let’s have some quiet reading time together. She shrieks excitedly, because she knows this routine, she knows this game, and she always wins. I smile as I walk away, listening to the thud thud thud of my child crawling after me. She makes her way down the hallway, around the corner, weaves past the couches and the wood blocks on the floor, beelines for the bookcase. Why don’t you help Momma pick something out?, I ask her. She giggles. She wedges herself between the reading chair and the bookcase. This part – this pulling-books-from-the-shelf – is a job she takes very seriously. She pulls books out, bangs them on her head, tosses them on the floor. Be gentle, Charlotte, my love, my beautiful girl. Hold them like this and set them down like so. She looks at me and smiles, just a baby looking for encouragement from its mother. My baby. Looking for encouragement from me. She knows not to tear the pages, not to fold them, not to rip the covers. Someday she’ll understand to be gentle too. Right now I just smile back. A dozen books hit the floor. Bring one to Momma, I laugh. Can you bring a book to Momma, Charlotte, my love, my beautiful girl? She looks at me and looks at the pile of books and I think THIS, this is it, this is going to be the day that she brings a book to me. I swell with pride, with the thrill of anticipation. Look, Momma, her smile says, a ball! I found a ball! Oh well, I think. I put the books back on the shelf and pick out four to read. I cuddle her on my lap and together we read. At the end of each phrase, I ask her to help me turn the page. She turns three at once, so the story has a hole in it. Maybe she’ll bring a book to me tomorrow, I think. But right now, I’m just proud she turned the page. Good job, Charlotte, my love, my beautiful girl. I kiss her head. Good job. *** The winner of this week’s book giveaway for Out of the Egg (by Tina Matthews) is Lisa. Congratulations, Lisa! So sweet Sarah! Charlotte is always soo adorable, and I love that she knows to crawl to the bookcase!! Bailey is just now turning pages back and forth, well and EATING the book :)! And, teaching Charlotte to fetch will be easier than it was to teach ‘ol Hank. One day, she’ll just do it on her own. Completely unasked. And, you will laugh and cry at the same time. It has been a long time since my kids were little and crawling around the house. It brings back memories of when my kids were young. These are the sweetest most gentle photos. I love the juxtaposition between fluffy soft kitty and plump smooth baby-skinned Charlotte. The cuteness. It kills me. oh charlotte is so cute! she is seriously so lucky to have you reading all those great books to her. Love the name Charlotte. So pretty. And she really is a doll. I love that stage when they are all about discovery. Such joy in finding a ball of all things. Great story. Thanks for sharing. That’s so precious! I can’t wait for the little tipity tap on the floor behind me as I walk around the house. We’re getting close but aren’t there, yet. adorable pictures ! i can’t wait either !! Your Girl is so DARN Adorable!!!!!!!!!!!!!!!!!!!!!!!!!!!!!!!!! What a lovely way to teach her the love of books and reading… your cat is darling too! Love this post! I don’t think I’ve ever read details about a mother reading to her baby like in this post. And I suppose that’s strange because it’s something that we all do so often (hopefully). Thank you for documenting the experience! so very sweet! 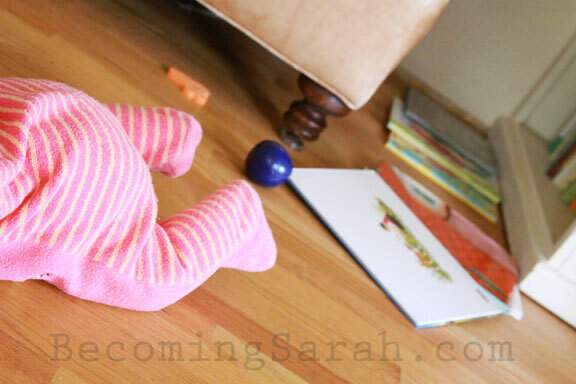 I can’t believe she’s old enough to crawl! Next entry: Behind the Blog: KIKI, the non-Greek. Previous entry: There is love here.